From Texas to the Northeast, Americans are yet again fighting off snow, slush and bone-chilling cold. WASHINGTON — On the latest snow day in a winter full of them, residents of parts of the South, Mid-Atlantic and Northeast were coping with several inches of snow on top of a layer of slush. With accumulations of 4-to-6 inches in Washington, Monday’s storm would have been the largest in the nation’s capital in all of last year. But in the seemingly endless winter of 2013-2014, it came 2 ½ weeks after a much bigger storm, and the region settled into a familiar routine of hunkering down. Schools and government offices were closed. Federal workers stayed home. Young adults gathered on the sloppy, slushy National Mall for a semi-organized, afternoon snowball fight. If the forecast holds, it would be only the third single-digit day after March 1 in the recorded history of the nation’s capital — and the previous two were in 1872 and 1873, according to the National Weather Service. Records were in danger elsewhere, too. In New Jersey, nearly 6 inches fell in some areas, which could make it the eighth snowiest winter in the last 120 years. “It’s one of the more disruptive winters of the last several decades,” New Jersey state climatologist David Robinson said. Federal workers are familiar with the routine. 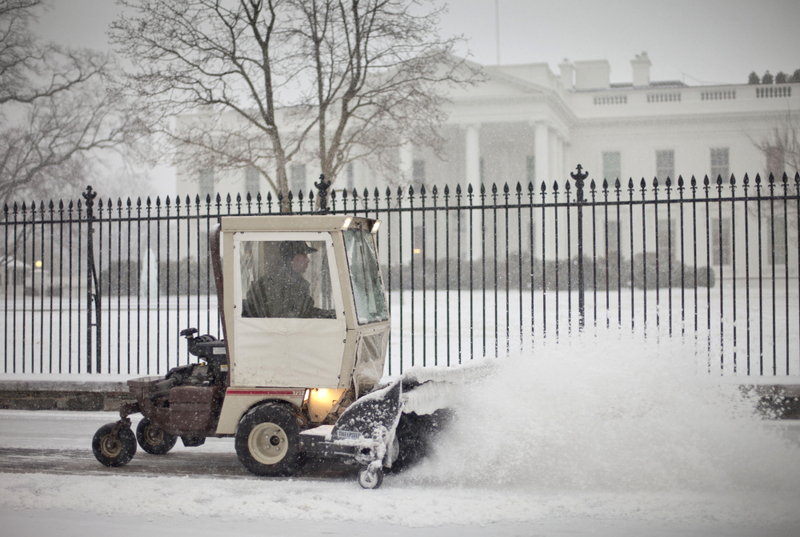 This was the fourth time this winter that the government has shut down because of weather — the most such closures since the back-to-back “Snowmaggeddon” storms of February 2010. In downtown Washington, the roads were messy but passable, and the snow had stopped by early afternoon. The worst conditions came during what would have been morning rush hour, but traffic was all but nonexistent. Commuter trains were canceled, Amtrak was on a limited schedule, and while the Metro subway system stayed open, the massive parking garage at the Springfield, Va., station was nearly empty. 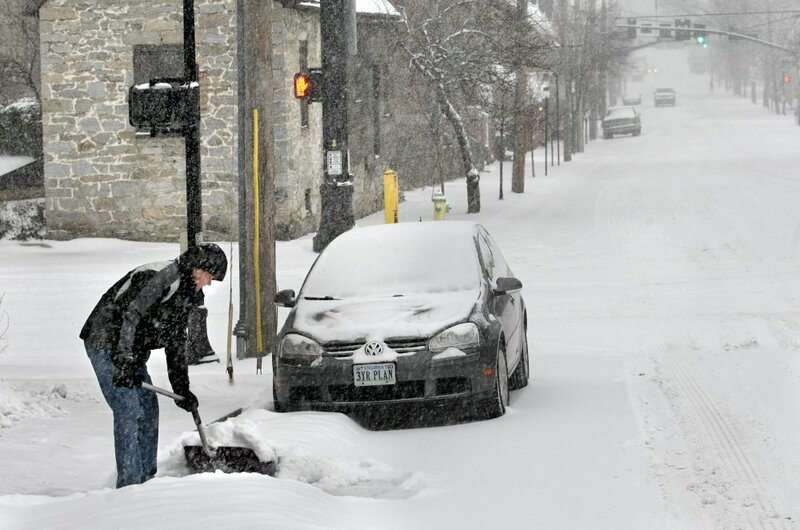 Jim Lee, meteorologist in charge at the National Weather Service in Sterling, Va., noted that every decade in Washington, there are only 6 days with 6-plus inches of snow. 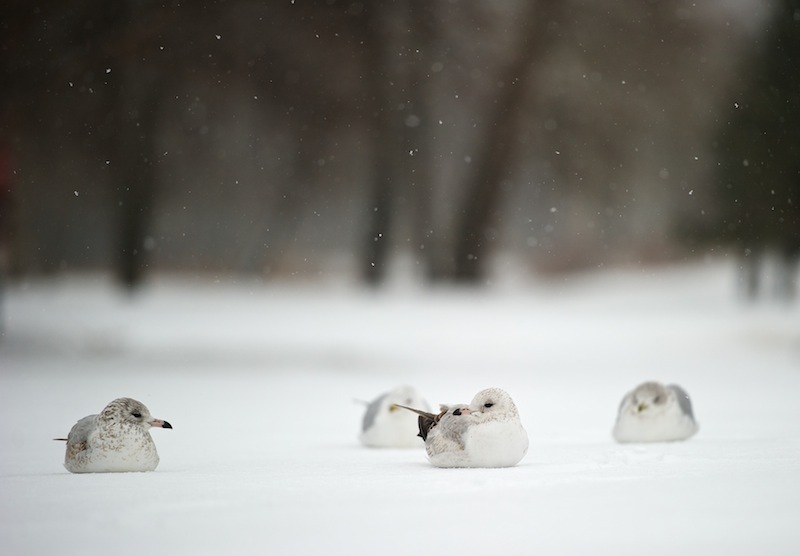 “We’ve had pretty close to two of them this year, already — and winter’s not over,” Lee said. Tourists, who flock to the nation’s capital 365 days a year, were seeking out whatever activities they could find. In the morning, the Supreme Court heard oral arguments inside a chamber packed with out-of-town visitors and legal wonks. By noon, crowds were growing at the National Air and Space Museum, the only Smithsonian institution that was open Monday. Among them were Russ Watters, 60, of St. Louis, and his 14-year-old son, Seth, who was touring Washington with his 8th-grade class. “We’re trying to find stuff that’s open, so this is open,” Watters said. The group planned to stay on their bus and get drive-by lessons on the city’s monuments in the afternoon. Government offices and schools were also closed throughout Delaware, parts of which got 6-plus inches. Further south, there were more problems. The Richmond, Va., area got several inches of snow, and Virginia State Police troopers had responded to more than 800 traffic crashes across the state by 3 p.m. Monday. Police reported one fatal weather-related crash southeast of Richmond. 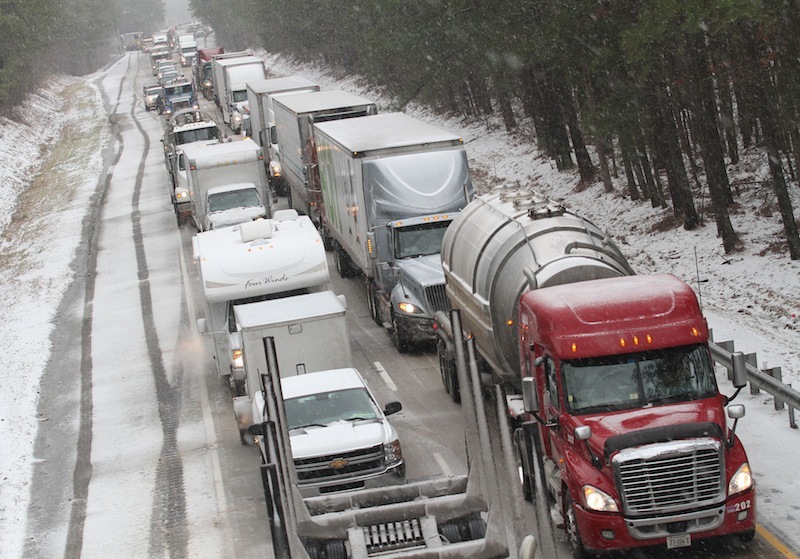 Governors declared states of emergency in Virginia and Tennessee, where there were hundreds of traffic crashes and tens of thousands of power outages. More than 2,800 flights in the United States were canceled as of Monday afternoon, according to flight tracking site FlightAware.com. The bulk of the problems were at airports in Washington, New York and Philadelphia. In Texas, An American Airlines jet taxiing to a maintenance hangar slid off a taxiway at Dallas-Fort Worth International Airport during freezing weather Monday. A spokeswoman for the airline said there were no passengers on board and nobody was hurt. The MD-80 jet came to a stop in a grassy area and wasn’t damaged, the spokeswoman said. Winter weather advisories have been issued from Monday evening into Tuesday in parts of the state. In suburban Falls Church, Va., dozens of pre-teen daredevils went sledding and snowboarding down a steep hill behind an elementary school. But Maya Luera, 11, was unhappy that the snow day would force the school system to tack another day onto the end of the year. “I’m more of a summer person, so I’d rather have more free time in the summer than the winter,” she said.